U Can't Anvil The Truth: London Bridge Terror Hoax Revealed By The Perpetrators In Plain Sight!!! London Bridge Terror Hoax Revealed By The Perpetrators In Plain Sight!!! London Bridge before attacking revellers with hunting knives. Up to seven people were feared dead and 20 hurt in the 10pm attack. Staff at a packed pub locked the doors as the gang tried to smash their way in. One man was stabbed five times. 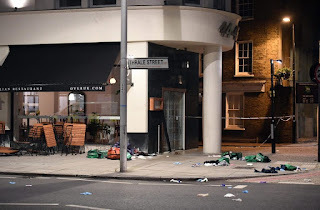 A picture taken outside the Wheatsheaf pub in Borough Market shows two of the terrorists lying dead – after being gunned down by cops. 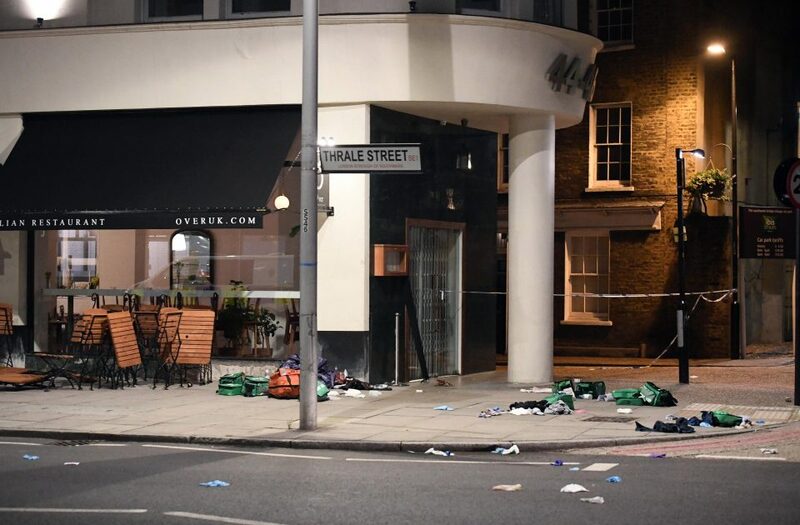 Four explosions – believed to be controlled explosions by police – were heard outside The Sun offices in London Bridge between 1:23am and 1:49am. Note The Number 444 in the picture which when divided by 4=111 This is a Lie. Note The THRALE STREET street sign in Francis Bacon Gematria Sum to 463=90p.